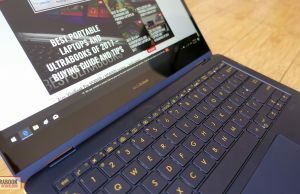 Summary: The Zenbook Flip UX370 is a vanity laptop, the option to consider if you absolutely must have the thinnest and lightest 2-in-1 out there, and we rated it with this particular detail in mind. 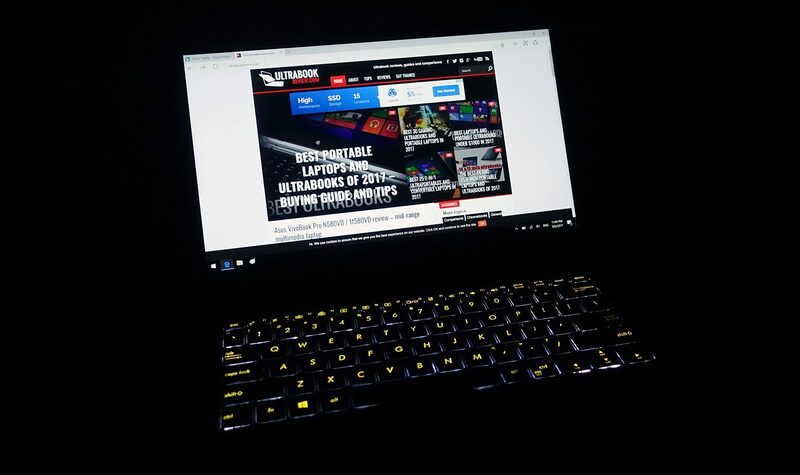 It's still a good laptop when you look past it, with a premium build, nice keyboard, excellent touchscreen with pen support, modern hardware and overall solid performance with daily use. It is however expensive and it compromises on battery life and IO in order to meet its portability goals, that's why you won't get the best value for your buck with this one. Read on for the whole story. 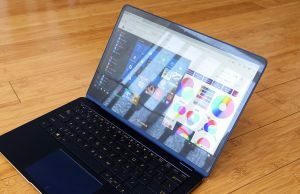 2-in-1 thin-and-light laptops have been around for a few years now and they’ve got to the point where they can meet most expectations, with few to no compromises. 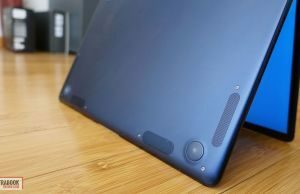 Most of them are still fairly heavy to hold and use in tablet mode, which is the number one reason you’d want a convertible over a regular clamshell design in the first place, with the better options like the HP Spectre X360 13, Samsung Notebook 9 Pro 13 or Lenovo ThinkPad X1 Yoga weighing around 3 lbs. 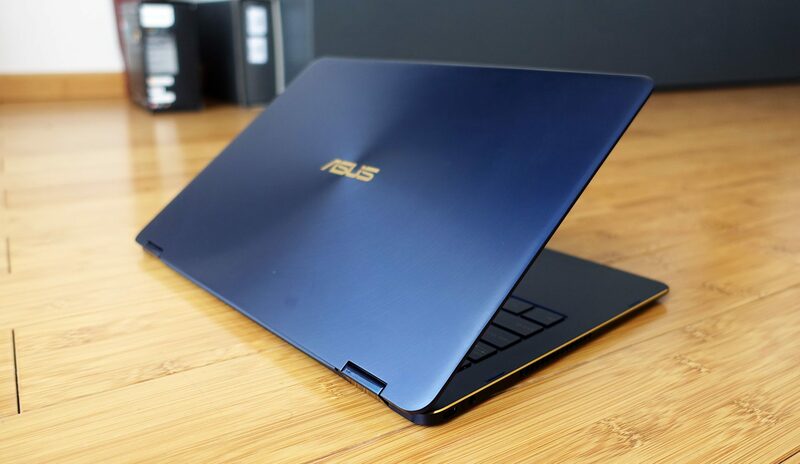 Asus are no stranger from this niche, as their Zenbook Flips are some of the better mid-range 2-in-1s on the market. 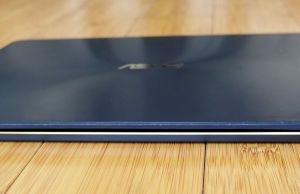 But now they have a new unit in town, the Zenbook Flip S UX370UA, and we’ve spent some time with it lately and gathered all our impressions below. 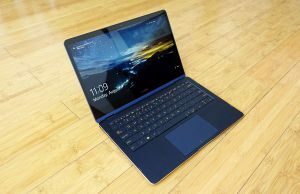 This one gets the latest Core U hardware, a 13-inch touchscreen with stylus support and a premium build in what Asus called the “World’s thinnest convertible” at the launch event back at Computex. It’s also lighter than all the competitors at this point, at 2.4 lbs. 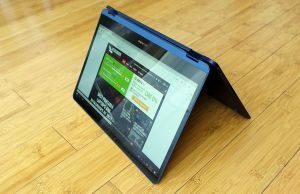 I have to admit I was skeptical about this product, as such targets are only met by compromising on some of the practical aspects, as we’ve seen in the past with computers like the Acer Spin 7 or even the Samsung ATIV Book Spin. That happens here as well with the miniaturized IO and especially a small 39 Wh battery inside, which makes the UX370 a niche product. But the IO is fairly standard for such thin-and-light convertibles these days, so the only important question you have to ask yourself is whether you’re willing to sacrifice on battery life for the sake of the light build. 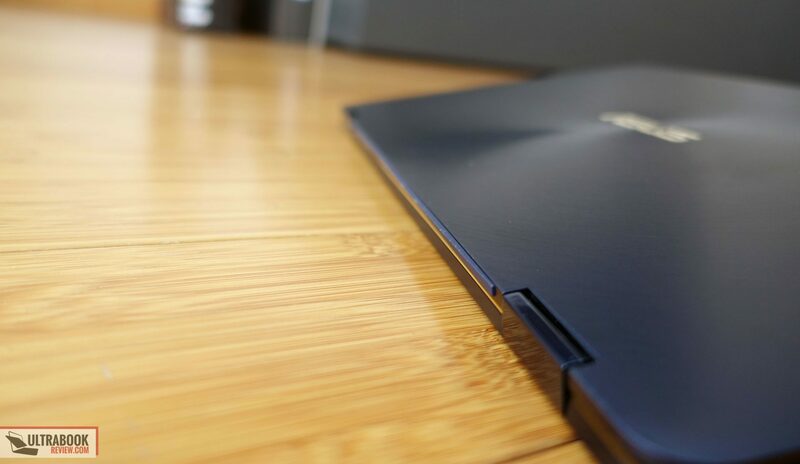 If the answer is yes, this Zenbook Flip UX370UA should be on your list. Read on for our indepth impressions, with all the goods and the quirks. Note: An updated version of this laptop is available in the meantime, with a smaller build and fewer compromises. 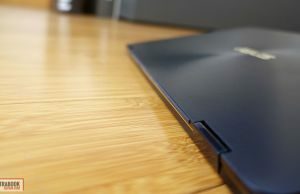 You can read all about the Zenbook Flip UX362 series in our detailed review. 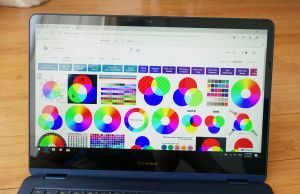 The Zenbook UX370UA has its limitations, but they’re not in terms of build or design. Aesthetically, this laptop is pretty unique. We got the Royal Blue version, but Asus also offers a Smokey Grey model which looks really nice as well, but will probably show smudges easier. 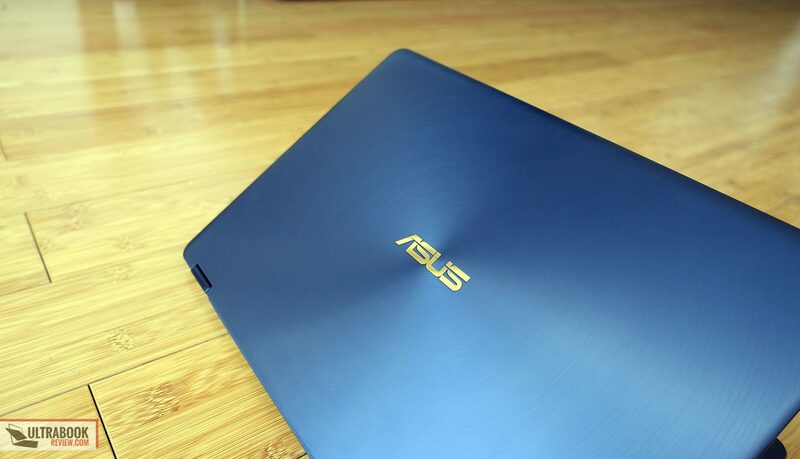 Both get a golden Asus logo on the hood and golden machined trimmed edges around the interior, as well as golden keys with white backlightning. I’m not a big fan of these golden accents, but I have to admit the UX370 is beautiful. Looks aside though, this notebook is not only very thin, but also light and compact. 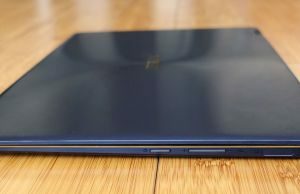 It’s just a tad longer than the HP Spectre X360 13, which is and has been the standard in terms of thin and lights convertibles for a while now, but lighter by .4 lbs and thinner by 3 mm, without sacrificing on the build quality. 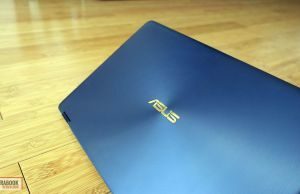 The Zenbook UX370 gets an unibody aluminum build and is crafted from what Asus calls aerospace grade aluminum, which is supposedly tougher than standard aluminum. 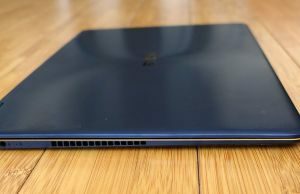 It basically gets the same build as the Zenbooks UX390 and UX490, which is pretty solid, but there are two aspects that could have been done better. One of them are the two hinges. 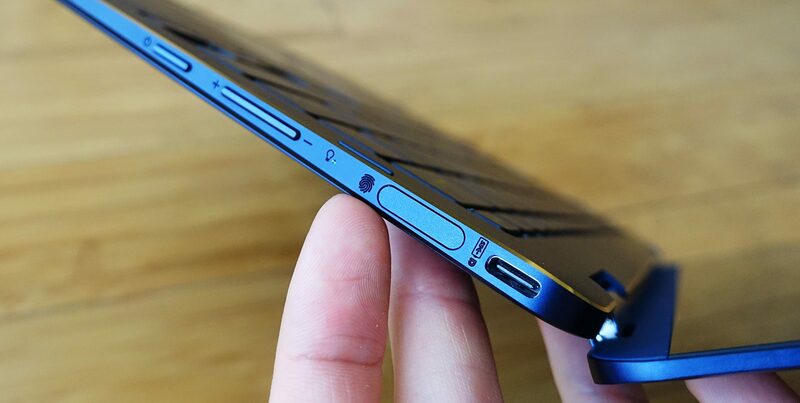 They’re small and made from some shiny blue material that feels metallic, while the entire laptop gets a matte finishing, and I just can’t understand why Asus didn’t go with matte hinges as well. Initially I thought the screen lifts on these hinges when opened past 90 degrees, so the hinges would become the contact points with the desk; I reckoned the glossier finishing was perhaps more durable and that’s why it was chosen. 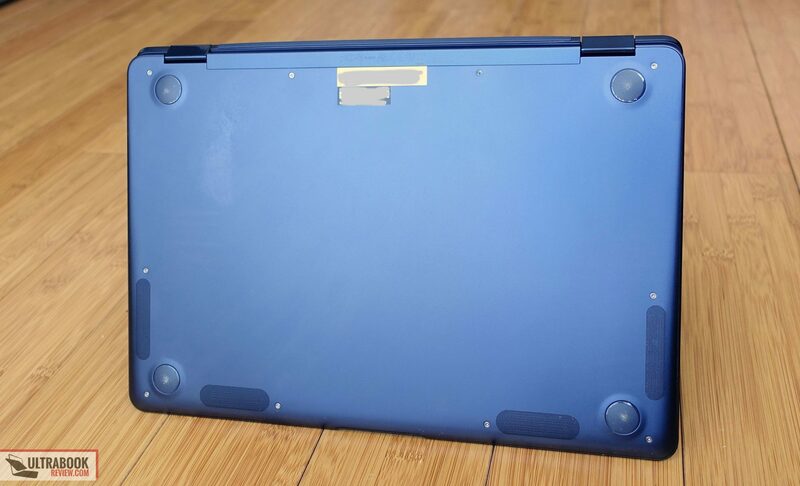 But then I realized that the screen actually lifts on a dedicated plastic foot on the back side of its frame and not on the hinges, so now I just can’t justify why Asus went with this design for the hinges instead of keeping the entire theme unitary. The hinges are also quite weak and struggle to keep the display in place when grabbing and moving the computer around the office. Knowing that you would aspect they would at least allow easy one hand operation, but that’s not the case. You can grab the screen from the smartly designed wedge on the front lip and lift it up easily to about 45 degrees, but past the hinges stiffen and you’ll need both hands to pry it open. 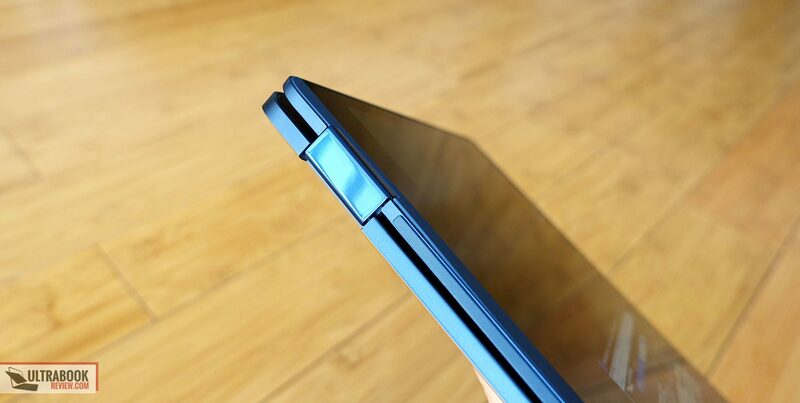 The other aspect is the build quality of the screen frame between these two hinges. 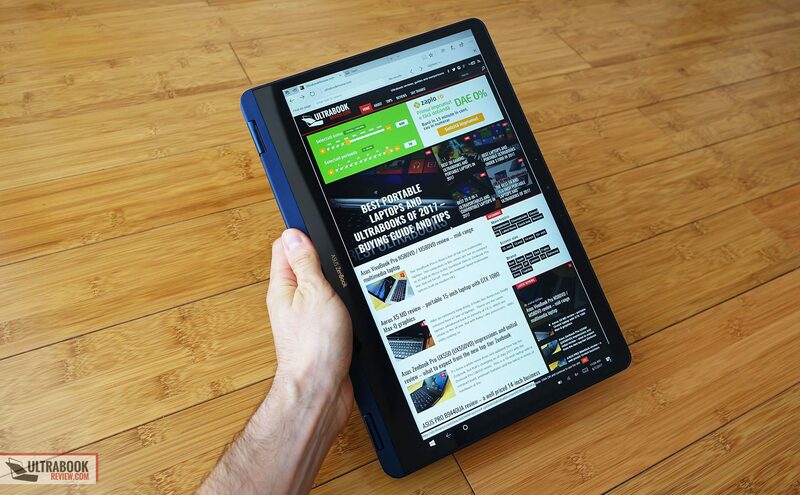 You’ll notice that it flexes, especially in tablet mode when you’ll grab the device from this place that’s the more comfortable to grab from, as there’s no cooling vent here like on other 2-in-1s. I doubt this particular aspect will have an impact on the laptop’s long term reliability, but Asus should have reinforced it to match the overall strength of the rest of the chassis. And that’s because the main body and even the rest of the lid-cover are pretty tough and don’t bend or warp in any noticeable way with daily use. So all in all I’m feeling confident grabbing and throwing this laptop in my bag, but not that confident grabbing it in tablet mode from the most convenient place, the screen’s bottom edge. The Zenbook UX370 is a convertible as you know by now, which means its screen flips back to 360 degrees. 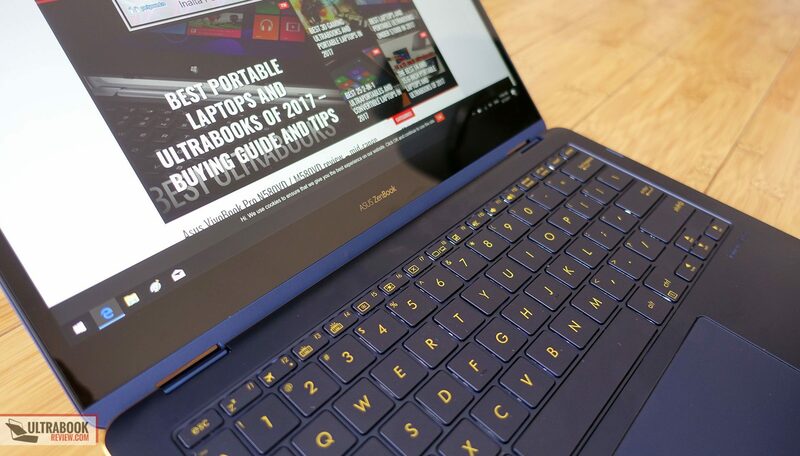 It’s a very nice laptop, and aside from that build quality quirk I mentioned earlier, a pretty nice tablet as well thanks to the narrow bezels around the edges and overall reduced weight. 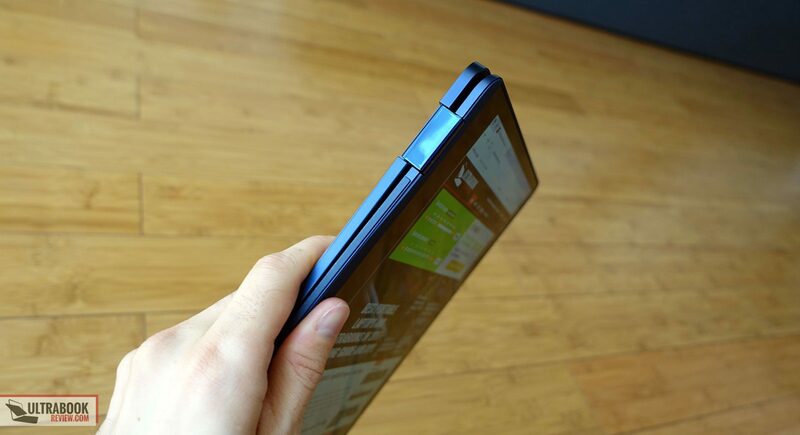 Magnets keep the screen attached to the main body in tablet mode, but their grip is pretty weak. Even with its quirks, this is a fairly practical computer. The beveled edges around the interior are somewhat sharp, but given the very low profile of the main-deck your wrists won’t ever come in contact with them. The palm-rest is spacious and the rubber feet keep the laptop well anchored on a desk. The underbelly is flat and simple, with speaker cuts on the front and two small intake grills on the sides. They’re not optimally sized or positioned in my opinion, but we’ll talk more about that further down. The hot air is pushed out through the grill on the left edge, which suggests a different internal layout that on most other convertibles who usually get the exhaust between the hinges. One final aspect we should mention here is the IO, which is limited to only two 1st gen USB 3.1 Type-C slots without Thunderbolt 3, and a headphone/mic jack. That’s neither surprising or unseen on such a thin laptop, but if Asus would have included Thunderbolt 3 support this laptop would have been more future-proof. Unfortunately none of the premium Zenbooks get Thunderbolt 3 this generation, so you’ll have to accept the slower and less capable alternative here as well. 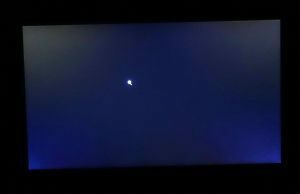 What you’re loosing is the ability to quickly transfer data over USB or hook up a 4K 60 Hz screen, which some of you might want to if you plan to use the laptop in a business environment. Asus includes a USB-C dongle in the pack, alongside a protective sleeve. It didn’t came with our test sample, but according to the official website, this dongle provides “an SD card reader, LAN, VGA, HDMI, standard USB 3.0 and a USB-C port for charging”. 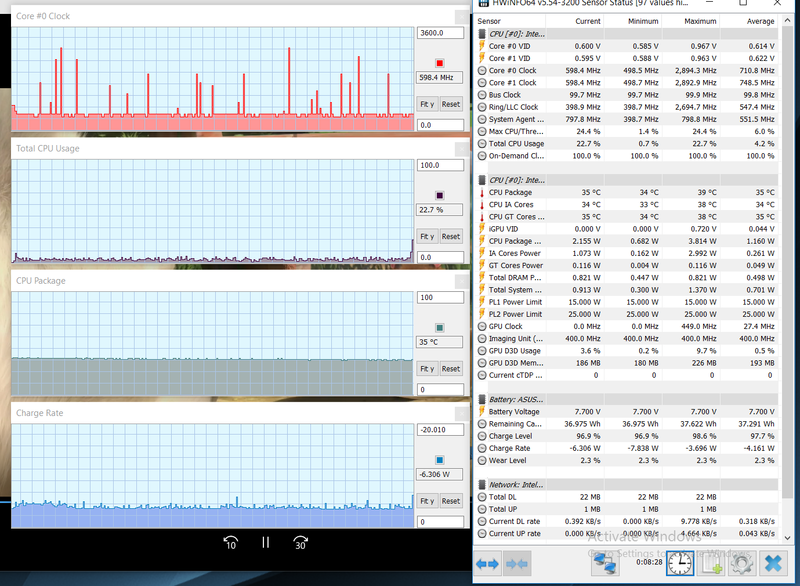 All in all I’m impressed with the Zenbook Flip UX370. It’s not only thin as primarily advertised, it’s also compact, light and with few exceptions, well built. 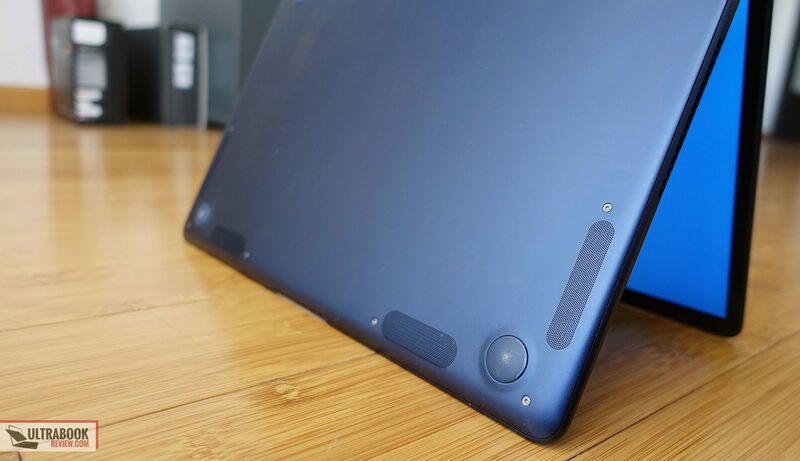 Thus, it provides a solid experience as a notebook, as a tablet or as anything in between. Too bad there’s no Thunderbolt 3 though and too bad the hinges aren’t as nice, aesthetically and functionally, as the rest of the construction. 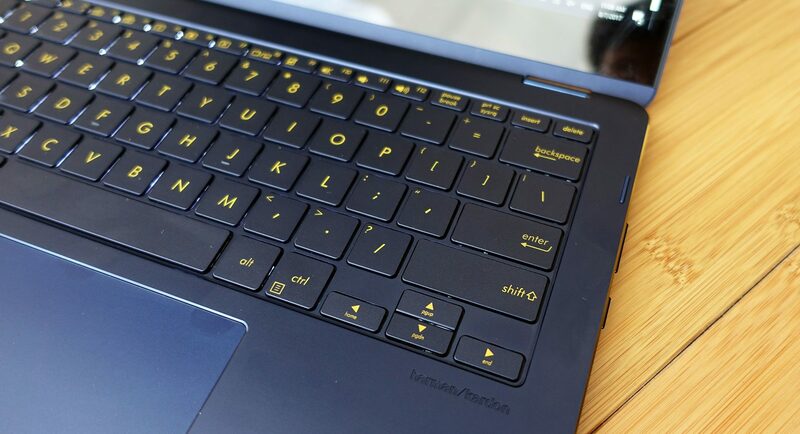 There’s a short stroke keyboard on this laptop with just 1 mm of travel, which you probably already expected given its very thin profile, and is again very similar to the keyboards on the UX490 and UX390. 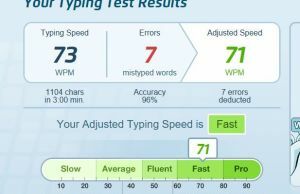 You might think that’s one more compromise, but it’s actually surprisingly good to type on once you get a hold to its feedback. The keys are big (16 x 16 mm) and well spaced, while the layout is pretty much flawless. Keys this big with shallow travel can get spongy, but I actually found them fairly rigid, to the point where I had to press them harder than on most other notebooks in order to actuate. 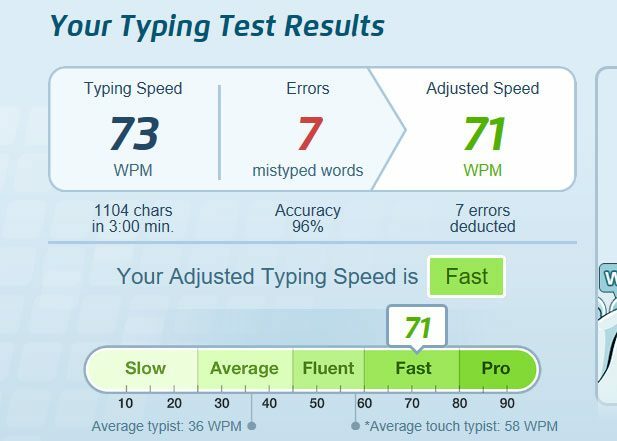 It took me a while to get used to this aspect coming from the much softer keyboard of the XPS 13, but a few thousands words later I can now type fast and fairly accurately on this keyboard, with still some occasional mistakes caused by the fact that I didn’t hit a key hard enough to register. While not ideal and not right down my alley, I do prefer such harsher feedback over having mushy and spongy keys though. Keep in mind I type for a living and have very particular expectations from a keyboard, but if you’re a regular user I expect you to get along well with this one. 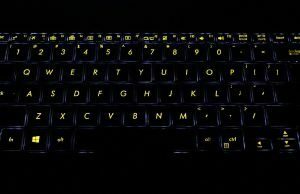 The keys are backlit, with white LEDs and three levels of intensity to choose from. 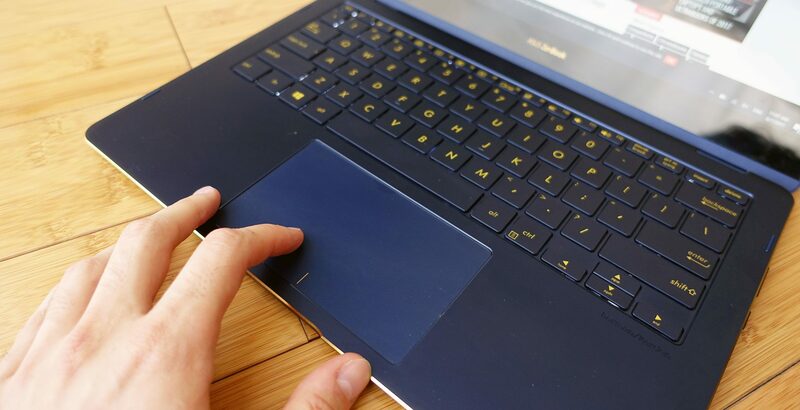 The illumination is activated by swiping fingers over the trackpad, or by hitting a key. As far as noise goes, I’d say most keys have a quiet chatter, with the Space key being a little louder, but it shouldn’t raise eyebrows in a library or other quiet places. For mouse Asus went with a glass Elan made clickpad, well set-up out of the box, but with very few customization options for the eventuality you’re not fine with its default speed and response, like on many of their other laptops. I didn’t ran into any stuttering or odd behavior with everyday use and don’t have anything to nitpick on. Well, perhaps I can complain a little about the the click buttons that are bit loud, but otherwise work fairly smoothly. 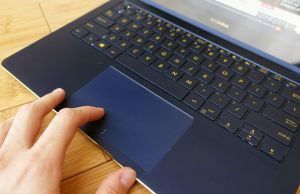 The Zenbook UX370 also gets a finger sensor that works well with Windows Hello, but is not very obvious on a first look because it’s actually small and placed on the right edge, near the volume rocker. This notebook gets a Gorilla Glass covered touchscreen with a pretty solid 13.3-inch IPS 1920 x 1080 px panel on our configuration, and there’s also an UHD screen option available.The FHD screen makes much more sense on such a laptop imo though. The AUO panel Asus went for is not a very commonly used one, as we’ve only seen one of its variations on the Acer Aspire S13 a while ago, but there’s very little not to like about it. At 340 nits it’s bright enough for most use scenarios, even for outdoors use, albeit you’ll still struggle with the glare caused by the glass screen. 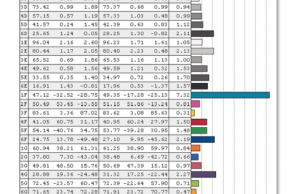 It’s also fairly rich, with contrast above 800:1 across the entire brightness range. 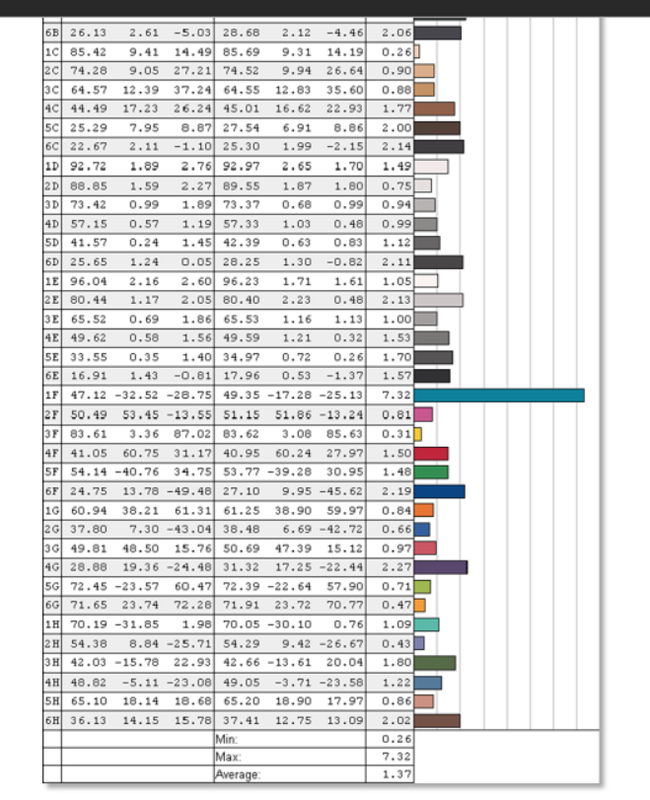 The color coverage is standard for a higher-tier IPS panel, at 74% AdobeRGB, and the color calibration is decent out of the box. 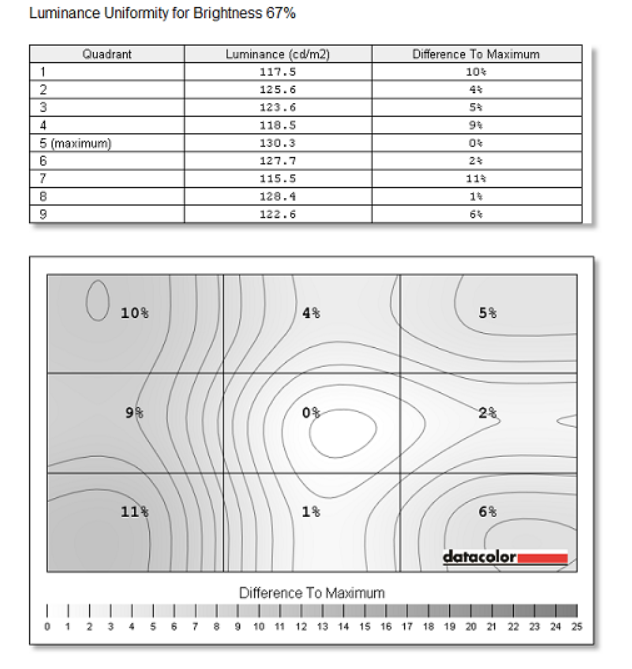 The slight skewage in gamma and gray levels can be improved with proper calibration, or you can use our calibrated profile available here. More details are available below, taken with a Spyder 4 sensor. 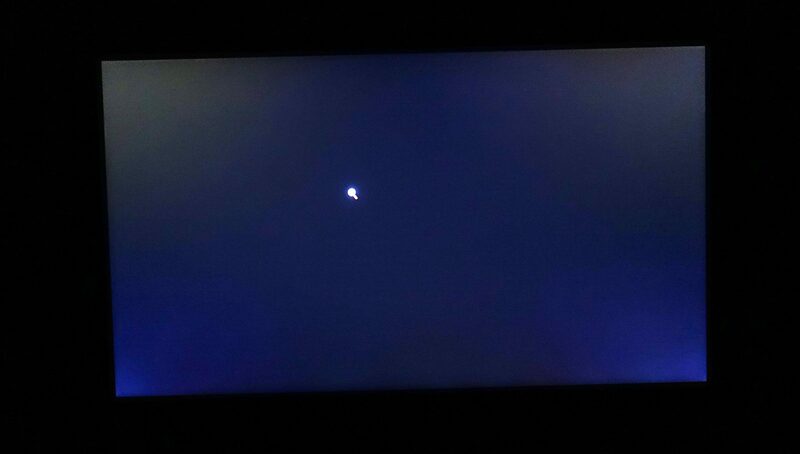 Black on max brightness: 0.41 cd/m2. I’ll also add that I didn’t notice any obvious light bleeding on this panel. 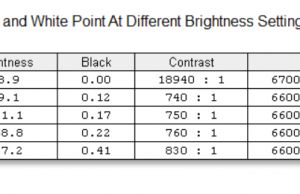 Some is visible at high brightens levels, on completely black images and in a dim environment, but it’s pretty much unnoticeable in daily use. There’s no PWM either and the viewing angles are solid, just as expected from a modern IPS screen. The screen is also compatible with the Zenbook Stylus, a nice looking metallic pen with support for 1024 levels of pressure and up to 150 hours of use from an AAAA battery. The stylus should come included with the laptop by default in most regions, but it didn’t come with mine so I can’t share any feedback or impressions. You’ll find some reviews online though, on Amazon. B&H or on the forums, and they seem to be mostly positive. As mentioned earlier that’s also a higher-resolution 3840 x 2180 px display option available for the Zenbook UX370. Can’t tell you anything about the exact panel choice, but I just wouldn’t recommend it anyway. The FHD panel is sharp enough at this size and a perfect match for the hardware and the battery inside this computer, while the UHD panel is much more expensive and power hungry, without even mentioning the scaling issues you might run into along the way. 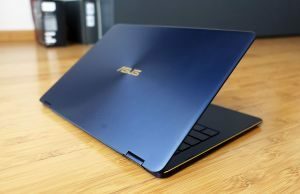 Asus offers this laptop in a few different hardware configurations and we got to test the higher end model, with a Core i7-7500U processor, 16 GB of RAM and a 512 GB NVMe SSD. 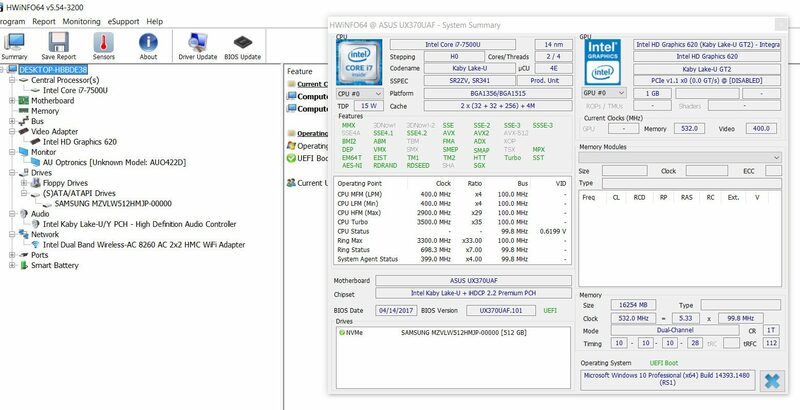 Update: I’m hearing there’s also a model with the Core i5-8250U quad-core processor scheduled. Should be interesting, this article explains what to expect from the i5-8250U CPU and how it compares to the i5-7200U and i7-7500U. Everything is soldered on the motherboard, except for the SSD and the wi-fi chip as far as I can tell. I couldn’t get past the back-panel though. It’s only hold in place by a handful of Torx screws visible on the back as far as I can tell, but after removing those there was still something that kept the back panel strongly attached to the main chassis. I was in a hurry and didn’t want to break anything on this loaner, so just gave up trying to open it, that’s why I can’t share any pics of the interior and the cooling. I’ll try to update this section in the near future. As far as performance goes, out unit handled everyday activities smoothly. 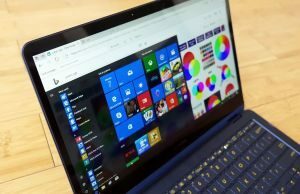 It gets a fair amount of bloatware that you should get rid off, but with that out of the way my experience with the laptop was pretty much flawless. The pictures below include more details on the speeds and temperatures you should expect with browsing, text-editing, movies and other everyday chores. 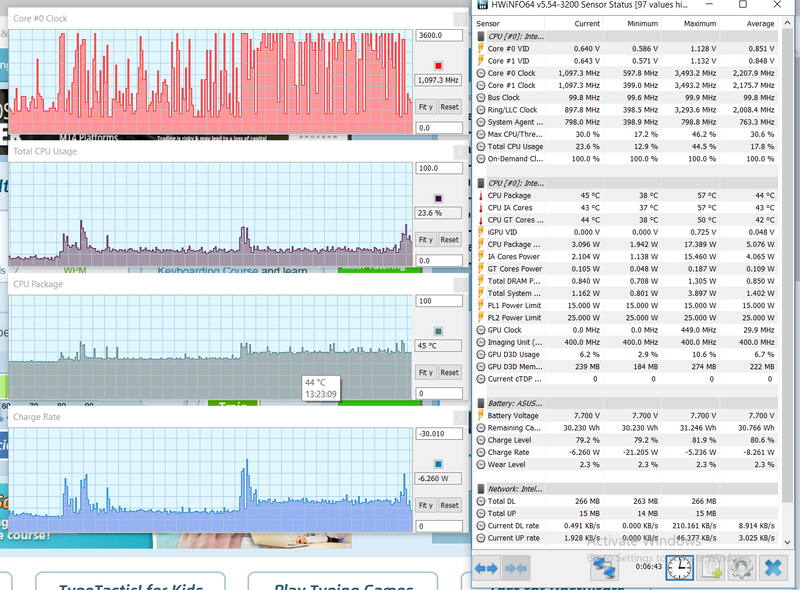 High demand loads on the other hand are a different story on this laptop. 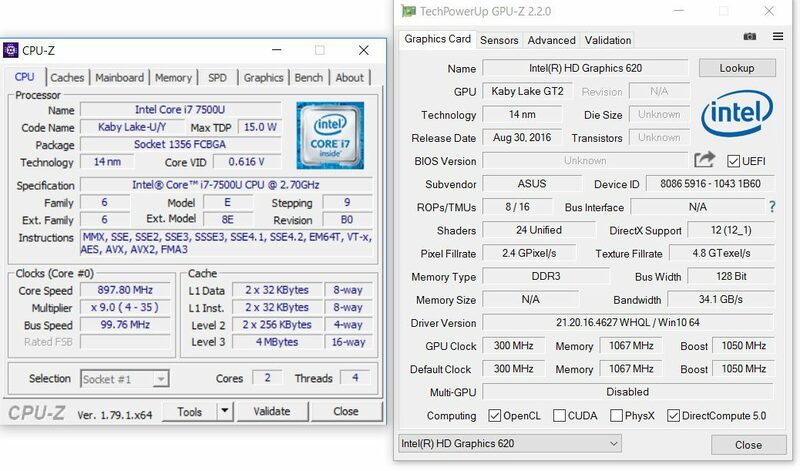 It should come to no surprise that the CPU clocks down to only standard 2.7 GHz speeds in benchmarks and it throttles to 1.1 GHz with games. Details below, including proof that this laptop works the same while plugged in or on battery. 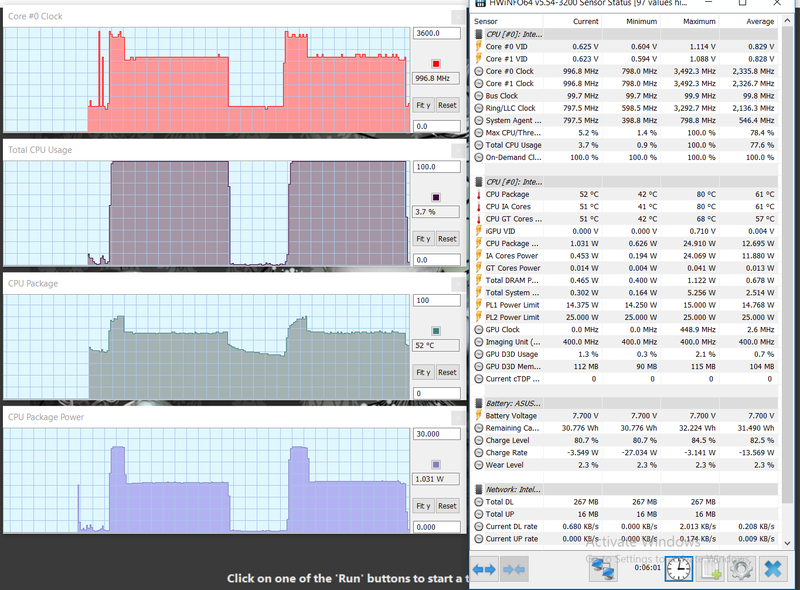 The pics above show that the CPU is thermally capped down as soon as it reaches temperatures of about 80 degrees. 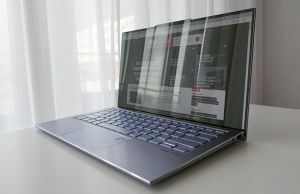 The i7-7500U processor can withstand higher temperatures, but given the laptop’s thin body I’d reckon Asus went with this approach in order to prevent the heat from building on the metallic chassis and end up with a laptop that would be too hot to be used comfortably. 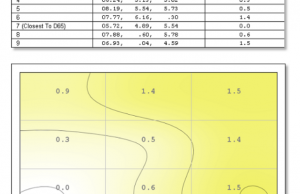 Even so, it still gets pretty hot with demanding loads, as you’ll see in the next section. 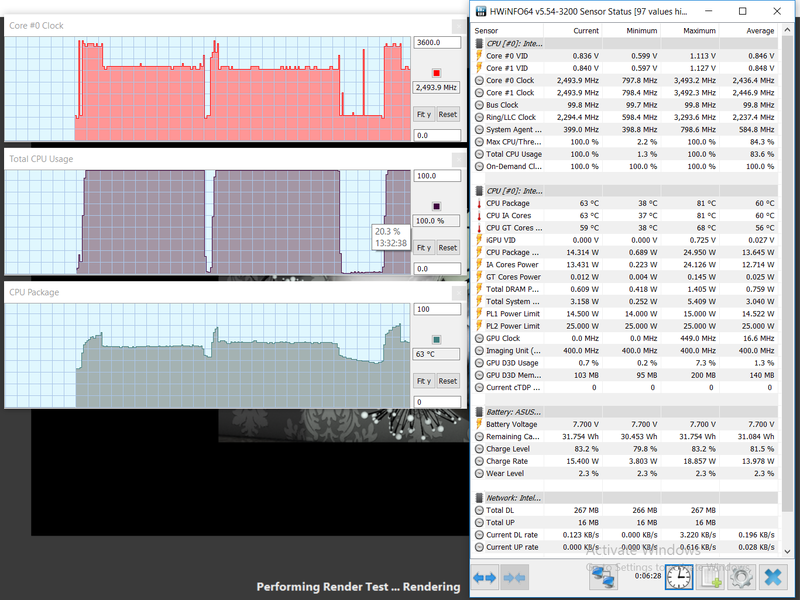 x264 HD Benchmark 4.0 32-bit: Pass 1 – 105.61 fps, Pass 2 – 18.02 fps. You must keep in mind that our review sample is a pre-production unit, so you should take these findings with a grain of salt. 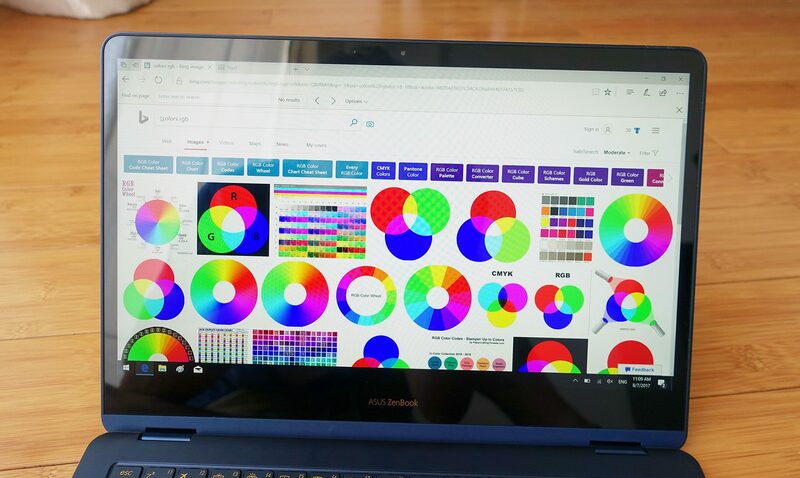 Still, given that we noticed similar behavior on all the other ultra-thin Asus notebooks built on this platform (the Zenbook UX390 and UX490, the Asus Pro B9440), I would expect the final retail units to perform pretty much as this sample. But gain, make sure to read other onions and reviews by the time those are available in stores and don’t jump to conclusions based on this review unit alone. All in all, I’m not surprised in any way by these findings. 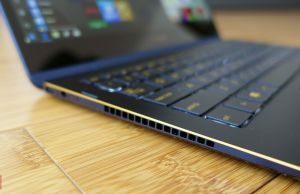 With few exceptions, thin-and-lights struggle to get the most out of an i7 processor in continuous loads, and this one is thinner than most other options out there. That’s a compromise you’ll just have to accept for the form-factor, and it’s up to you if it’s doable or not. As long as you don’t plan to run Lightroom or Premiere or games on thins thing, the speed drop won’t even a problem, as the UX370 provides solid performance with everyday activities. There’s also the question of which configuration gets you the most value. I would primarily recommend the Core i5 version as the smarter buy for the average user, as it’s cheaper and still good enough for everyday use. 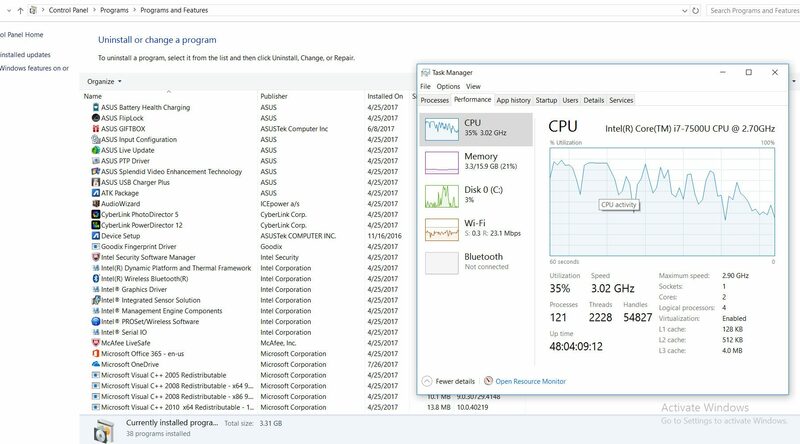 The Core i7 configuration is however the better option for those who multitask between many apps at once and keep tens of tabs open in Chrome, where HyperThreading and especially the 16 GB of RAM only paired with the i7 version are going to make a difference. There’s a fan inside this laptop hooked up to a simple cooling design, with one short heatpipe that goes from the CPU to the radiator. I don’t think there’s a lot more Asus could have done with this design, but I do think they should have created wider intake cuts on the underbelly, preferably spanning across the fans and the heatpipe. The exhaust is nicely done though, with the radiator on the left edge pushing hot air away from the user, but overall there’s still that much the tiny fan inside and the thin heatpipe can do here. The fan is active all the time, as you probably expected. It’s not very loud with daily use, I measured about 38 dB at head-level with movies and 40 dB with multitasking, so you should barely hear it in a standard environment, but you’ll definitely hear it in a quiet room. I also noticed some high pitch coil whining, again audible at head-level in a quiet room, but especially if you put the ear on top of the keyboard. I must again stress this sample is a pre-production unit, so the electrical noise might not be an issue on the retail versions. In fact, it probably won’t be, judging by the fact that I didn’t notice any electrical noise on the other laptops with whom the UX370 shares most of its design. Back to the fan, it spins faster and much louder with gaming and other high-load tasks, up to 45-46 dB at head level, which means you’ll probably need headphones to cover its noise, so one more reason why you shouldn’t get this laptop for such tasks. As far as temperatures go, the UX370 stays well within comfort margins (low to mid 30s degrees Celsius) with daily use, with some parts on the back and on top of the keyboard getting closer to 40s with multitasking. 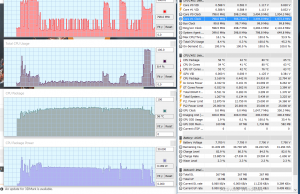 High load temperatures on the other hand jump to mid 40s and they’re actually quite good for a laptop with this profile and hardware, but keep in mind they’re kept in place by limiting the performance. 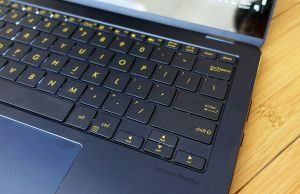 For radios Asus went with Wireless AC and Bluetooth 4.1 on the Zenbook Flip UX370, provided by a modern Intel 8260 chip. We had some issues with this test sample, but I’m pretty sure it was drivers’ based and the final retail units should perform smoothly, given our previous experience with the same chip on the Zenbooks UX390 and UX490. For audio the UX370 gets two speakers placed on the underbelly. They’re fairly easy to cover on the lap, which takes a small toll on the audio coming out, but as long as you keep them clear you’ll find them quite good. They’re punchy, at up to 81 dB at head level in our test, with no distortions and very little vibrations at high volumes. The sound is also fairly rich for speakers of this size, with low end noticeable from 80 Hz. 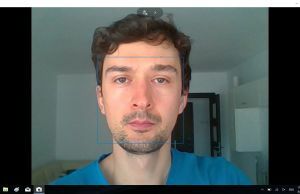 The webcam on the other hand is mediocre, as Asus still went with a VGA camera on this laptop, again like on the Zenbooks UX390 and UX490. So don’t expect to use it unless it’s absolutely necessary. 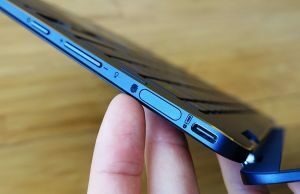 There’s only a 39 Wh battery on the Zenbook Flip UX370UA, which is small for by today’s standards and the number one polarizing factor about this computer. It allowed Asus to create this product that’s lighter than the competition, but at the same time the competition gets bigger batteries. 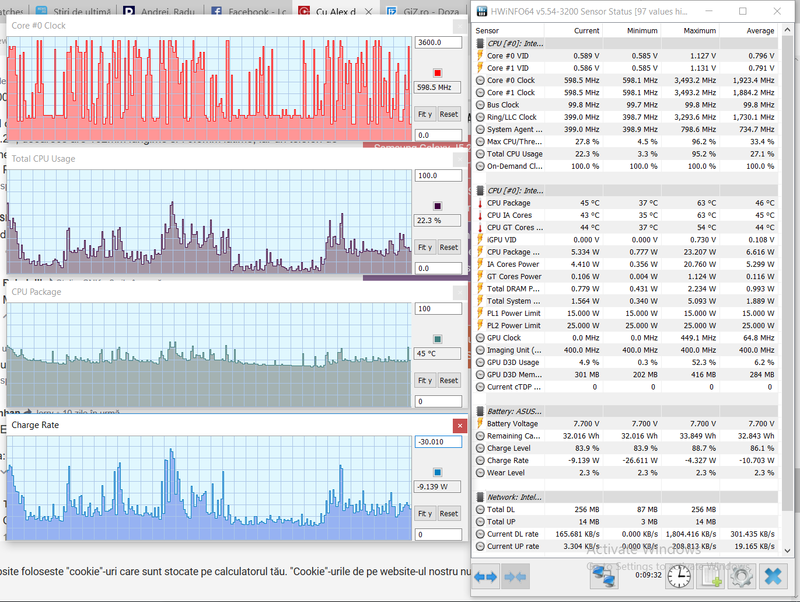 10.8 W (~3 h 30 min of use) – heavy browsing in Edge, Balanced Mode, screen at 40%, Wi-Fi ON. So all in all you’ll get about 4 hours of real-life use and 7-8 hours of video on this laptop, which is not bad. Whether is enough for your needs, well, that’s entirely up to you to decide. 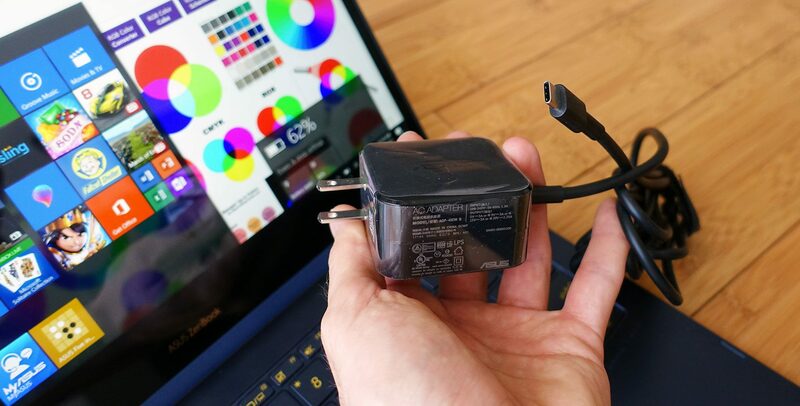 The Zenbook UX370 comes with a compact 45 W charger that only weighs .4 lbs (US version, cables included). It supports quick-charging, filling up 60% of the battery in under 50 minutes, and a full recharge is going to take about 1 hour and 40 minutes. As a side note, this notebook charges via USB-C and both of the existing ports provide power, so you can hook up the charger on either the left or the right side, whichever you find more convenient. Core i7-7500U, 16 GB RAM, 512 GB SSD, FHD screen – 1699 EUR. That’s 100 EUR on top of similarly configured HP Spectre x360 13s, which suggests the UHD model should sell for about 1900 EUR. These are initial list prices and I’d reckon the Zenbook UX370 will get cheaper down the line, so overall you should expect it to be priced similarly to the Spectre x360. Lenovo ThinkPad X1 Yoga – convertible, 2.99 lbs, 14.0-inch screen with FHD/WQHD panel and pen support, Core U hardware, 2x TB3 ports, 56 Wh battery, starts at $1700 for a Core i5 / 8 GB RAM / 256 GB SSD configuration. 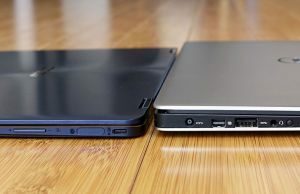 None of these is as light or as thin as the Zenbook Flip UX370, but they’re within .6 -.9 lbs and 1-4 mm in thickness, while they offer bigger batteries and better IO. 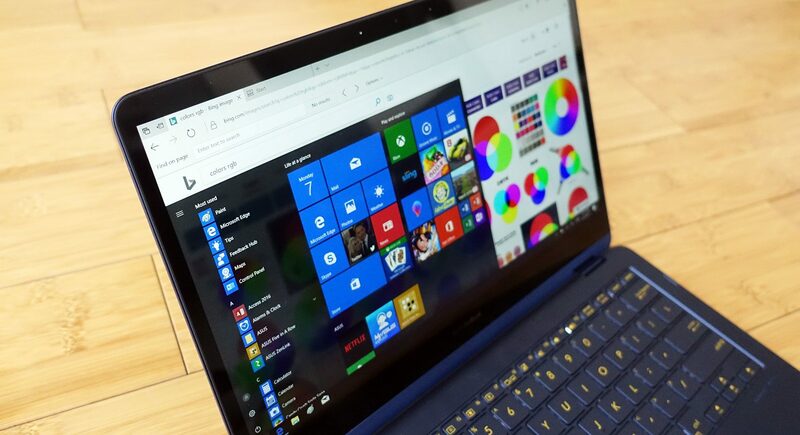 Many are also more affordable, while others like the Surface Book or the ThinkPad X1 Yoga have particularities that somewhat justify the higher price tags. 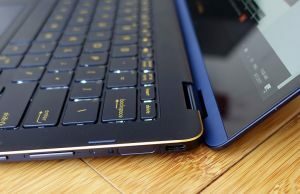 In all fairness, there is another laptop that matches this Zenbook in terms of thickness, the Acer Spin 7, but that one is a heavier laptop with a larger footprint, without a backlit keyboard, without pen support and built on Core Y hardware, so overall not a proper alternative to consider. 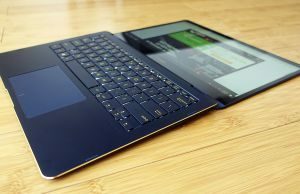 If you’re on a tighter budget, willing to compromise a little on the design lines and don’t necessarily need a digitizer, you could also consider mid-range convertibles like the Asus Zenbook UX360UA, Acer Spin 5 or the Lenovo Yoga 520. There’s a more detailed list of 2-in-1s that are worth your attention over here. 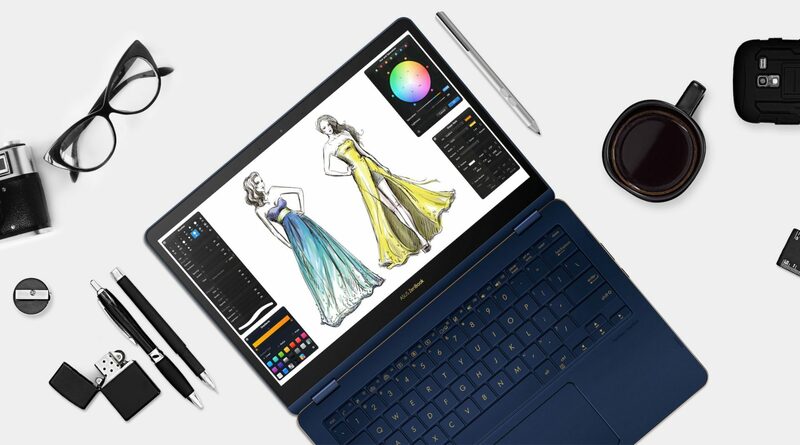 The Zenbook Flip UX370 stands out of the crowd as a thin, small and light premium convertible with powerful hardware, a good keyboard/trackpad, an excellent display with pen support and punchy speakers. You do get all these features on some of the competitors though, and that’s why its most important selling point is the thinner and lighter construction, with the unique design lines coming in second. 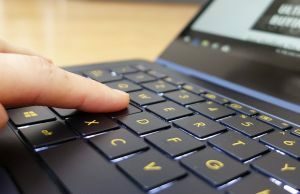 On the other hand, potential buyers should know that the Zenbook Flip UX370 compromises on battery size in order to be as small and light as it is, as well as on the IO and performance in demanding loads to some extent. 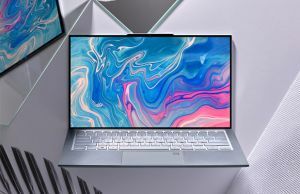 Knowing these, if you don’t absolutely have to get a laptop that weighs 2.4 lbs and is just .43″ in thickness and you can live with laptops that weigh closer to 3 lbs and are about .6″ thick, the Lenovo Yoga 720, the HP Spectre x360, the ZenBook UX362 or the Samsung Notebook 9 Pro 13 are better overall 2-in-1s with similar traits as those of the Zenbook Flip UX370, but also better IO, bigger batteries and more affordable prices in most regions. So in the end, judged objectively, this Zenbook is the notebook to consider if you absolutely have to own the sleekest 2-in-1 money can buy as of August 2017. It’s a vanity laptop and it’s very good at it, but it’s just not what I’d recommend to the vast majority of buyers that are looking to get the best value for their money in a premium convertible. 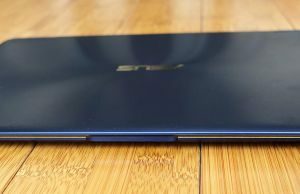 That pretty much wraps up this article, but the comments section is open for your feedback and questions on the Zenbook Flip S UX370UA, and we’re around to help out if we can. Good review. 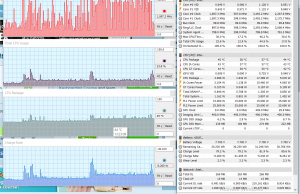 I question Asus choice of core i5/7. I think they should have gone with core i5y/i7y (core m). These are almost as fast in geekbench! They are also more suitable for this kind of device and it would have attracted people like me as I can not tolerate annoying fans. Otherwise a perfect device. But I won't touch it unless it comes fanless later (like the UX360CA). Well, Core Y is expensive and not that easy to cool. I'm a big fan of fanless experiences too, but I'm not so sure the Core i7y would run well on this build. If I were designing the product, I would have made it a little thicker and tweaked the fan profile so the fan won't kick under a certain threshold. I agree with you Andrei about the fanless desireability. But frankly I am not sure why you did not include the Lenovo 900s. 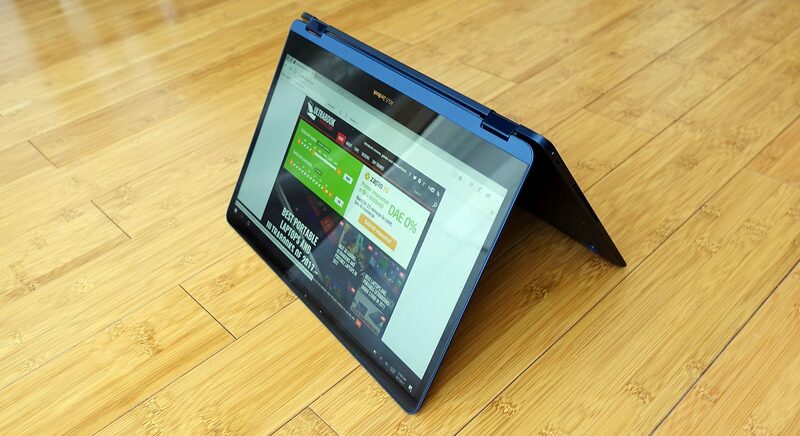 A bit old now but lighter and smaller with 12.8mm thickness and QHD display I find it to be more the laptop the Asus must compete to (pitched mainly as small and touchpad friendly). It's Core M though, while this Zenbook is Core U and the difference in performance is huge imo. These days I'd expect fanless Core U builds, there are some out there and hopefully there will be more for us to choose from. 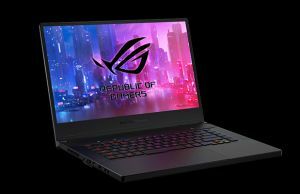 Intel just released their info on the Kaby Lake-R chips, and Asus's site now lists this laptop with the 8000 series chips. From your experience, do you think this model will actually receive that upgrade, and is it worth waiting? Other's I was considering are the newly announced UX461, and UX331. The convertible ability is nice, but not essential after all. Possibly the HP Spectre or Dell XPS13 too, but again, I prefer Asus. The quad-core KB-R would make little sense in this chassis. Perhaps an update will be available with Coffeelake Core Y later on. 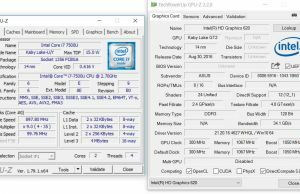 thank you for the excellent testing work that you do, I have had not a fair experience with a few Asus pc, and after seen and touched with hands the HP Spectre X360 I felt that is structurally much better than the Asus machines I owned till today, is it there many difference between the i7-7500U of the HP Spectre X360 and the Intel Kaby Lake Core i7-7500U CPU of Asus Zenbook Flip UX370 please? 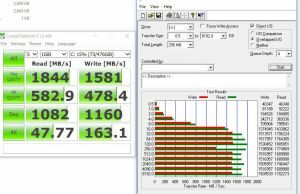 Performance wise, the i7-7500U throttles faster on the UX370, but whether you'll actually see that in real use depends on your usage. Thanks for this review! I'm thinking of buying one very soon however I saw a review on YouTube that indicated the keyboard tray was very bendy and flexed to much and that the screen bounced around as you used the machine because the bins didn't hold it firmly enough. I think your review much more thorough, did you experience anything similar? There is a little bit of flex in the main chassis, yes, but it's nowhere as bad as you're saying. Tanks for your feedback. How do you cope with the loss in battery life? The Flip gets a much smaller battery than the Spectre. Would you recommend this over the ux490? I think the ux490 is hotter looking, but can't yoga and is more expensive. Many thanks for your fantastic site which helped me a lot to find my next laptop. I'm considering this model, but there are many circumstances which could have an influence on my final decision. In my country Asus ux370 with i7 8500u/16Gb/512Gb Pci-e SSD is the cheapest option compared to other 2in1 ultrabooks with same specs. The aforementioned ux370 config costs Eur 1570 which is around Usd 1840 – dongle, pen and Tax (27% :() included. 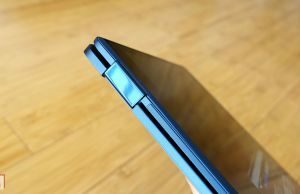 The same Lenovo Yoga 920 costs a whopping Eur 2050. The similar Dell XPS 13 is Eur 1785 – not the 2in1 version. The 16Gbyte HP Spectre X360 is not available by us with the same specs, but the 7500U version w 16Gbyte Ram is Eur 1685. I need 16Gb RAM and a fast 8th generation U processor as I have to do my demanding jobs -design works, photo editing, etc. 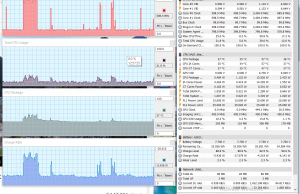 – on-site on my laptop occasionally, instead of my powerful workstation. Unfortunately most 8250 and many 8550 laptops come with 8 Gbyte soldered RAM here. Portability and design is very important as well as I do many presentations, and I prefer the 2in1 versions which can be useful in many situations -presentation, tablet, cooking at home, or watching a movie in the bed -. Long battery life is a nice to have feature, but I can accept 4-6 hours cordless time. 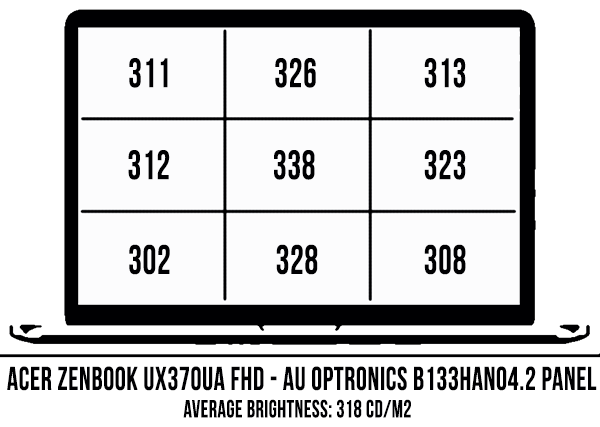 – Do you think that any of the mentioned laptops fits better in my scope than the UX370, considering the price differences? I have to finalize my decision and place the order in this year, so any answer or useful hints are well appreciated. What do you need the 8th gen processor for? 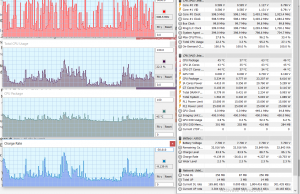 If it's demanding loads, while I haven't actually reviewed the UX370 with those processors, I'd expect them to throttle given the dual-cores throttled as well. See the performance section of the article. That's something to keep in mind. This Asus is cheaper and lighter, but with compromises in battery life and performance over the HP x360 and the Yoga 920 as well. 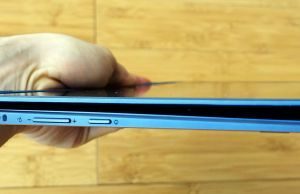 The UX461 is pretty large, however I would also have a look at the Lenovo Yoga 13 720, it's a pretty solid pick and slightly heavier. Many thanks for the quick reply Andrei! As I mentioned, I have to do some of my tasks occasionally on-site, without my workstation. These are Lightroom import/editing/export and batch processing of 36-46mp Raws, Photoshop with multiply layers, or some basic Premiere manipulation in 720-1080p, as part of our services to the customers. These happen seldom, 1-2 times a months in average. In the other periods I will use the laptop for standard business needs, such as word processing, presentation, web surfing, or watching videos. Gaming is not important. Battery life is not terribly important as I can manage these situations with my old, good Sony Vaio which barely lasts for more than 2 hours. :) But I want to change, as a 15,6" laptop with 4-5 lbs of weight and much larger footprint is cumbersome to carry with me all day. 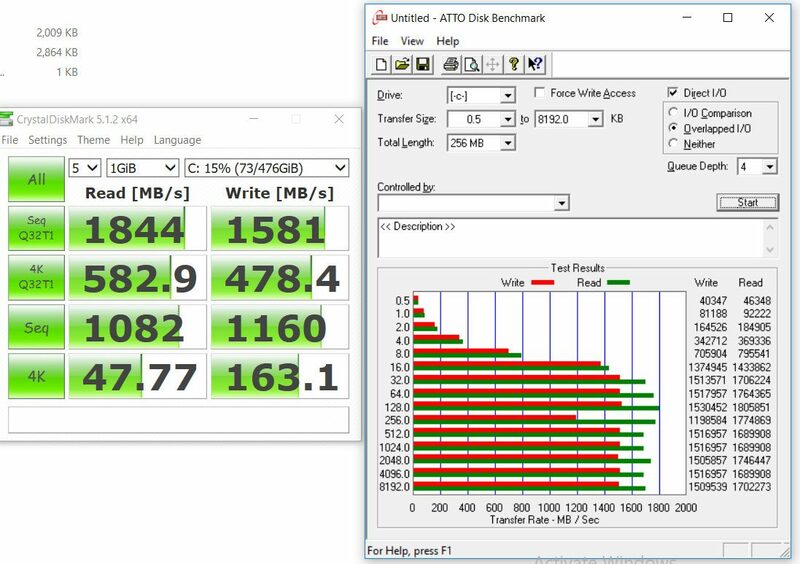 I can deal with the slightly heavier weight of the yoga 720 if you are certain, that I won't experience any performance improvement of the UX370's 8550u CPU because of the throttling. One more interesting question: do you see any improvement in battery life of the 8th generation CPUs in standard circumstances? 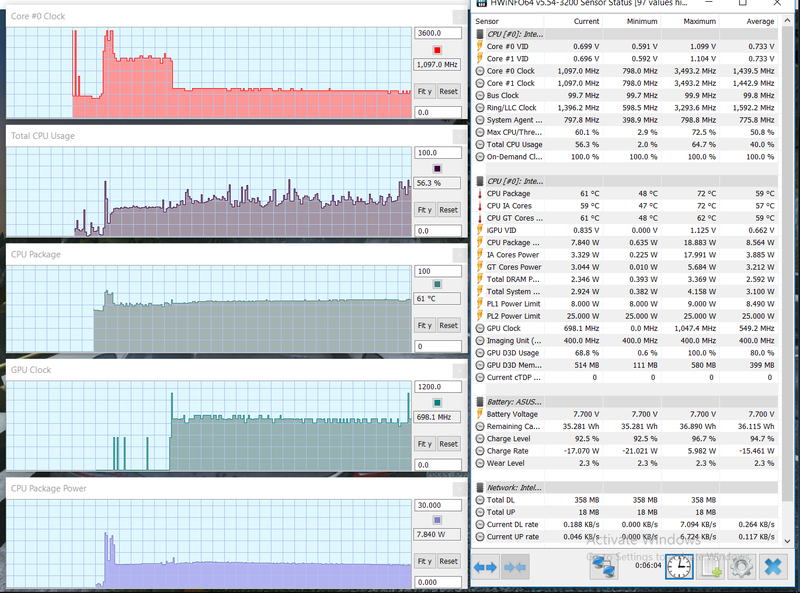 I guess they should have last longer in the same set because of the lower base frequency of the CPU cores. I'm not 100% certain, because like I said, I haven't tested it. 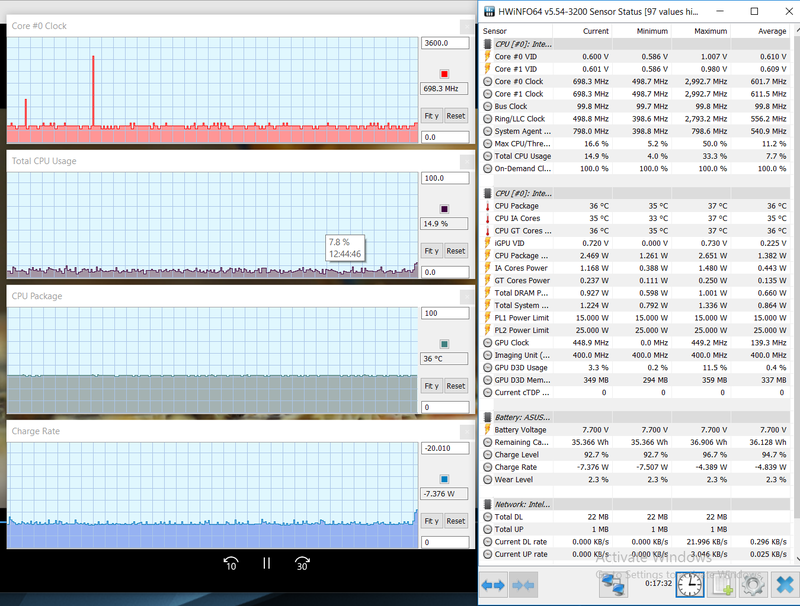 Based on my experience with the dual-core version, I do expect the 8550U to throttle. Perhaps you can find some other reviews and opinions from people who actually bought the 8th gen model. 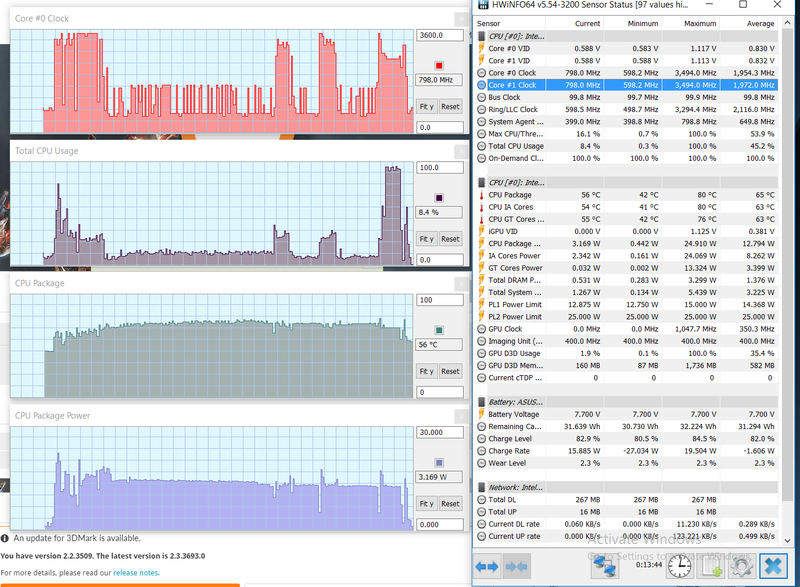 BTW, if that's a possibility, get the ux370, run your tasks and see how it performs. If it does good, keep it, either way, return it. Not sure how return policies are in your country, but that's a possibility in Europe, US, Canada, etc. About battery life, as far as I'm seeing right now, light use and video is about the same, while multitaksing is actually shorter with the 8th gens. PS: No need to comment twice, comments are manually approved so I can attend to each of them, but that usually takes a few hours to a few days. In the EU individuals have the right of free return de facto. But I've found a company which offers a "no question asked" 14 days return period for legal entities as well. I'll do that and write my opinion as soon as I was able to test the config! PS: as soon as I've recognized your approval policy I sent an email to your contact address. Sorry for any inconvenience. Great, let us know of your feedback after you'll get it. Here are my first impressions of my the UX370. After 3 days and around 30 hours of excessive testing, and evaluating I can say that this little gem has surpassed most of my expectations. 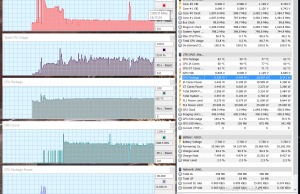 First of all, I have to admit that I optimize my laptops as much as I can, so these results will not refer to all UX370. My machine came with 16Gbyte Ram, I8550u CPU, 512Gbyte PCI-e SSD, quality sleeve, the smaller USB dongle, and a stylus. The package is excellent. After I've got rid of the preinstalled bloatware, I started my undervolting and optimizing procedure. First of all, a new BIOS version (3.02) was available, so I installed that. 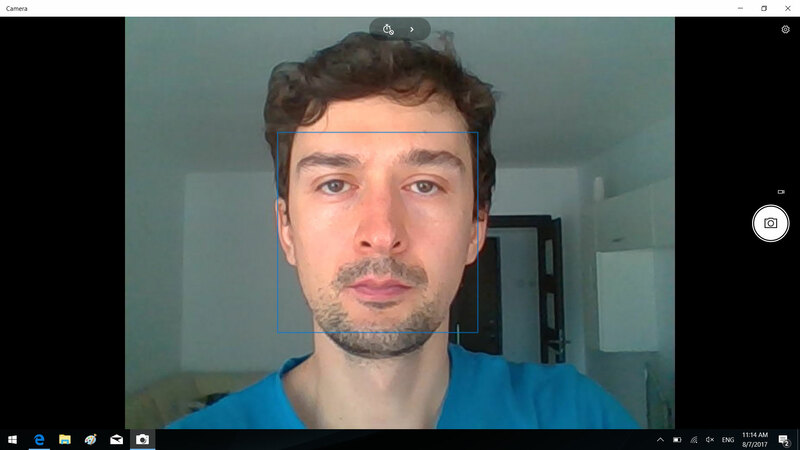 After Windows has finished with the new updates, and indexing, I have noticed something interesting. The laptop fan is off under 45 degree Celsius, so basically It is totally silent under standard circumstances. 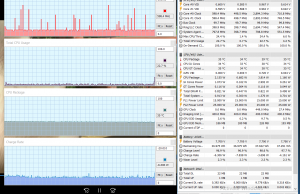 What surprised me as well, there was a small app -Quiet Fan- provided by Asus Live Update. 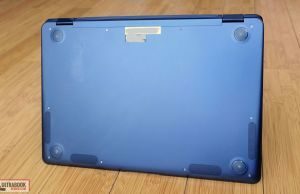 As far as I was able to check its behaviour, for the cost of around 25-30% loss of the maximum performance the laptop will be much less noisy during more demanding usage as well. This app has a system tray icon, so you can activate and deactivate it according to your needs. I think, there is no real need for Notebook Fancontrol anymore. The next step was the installation of Throttlestop and the setting and meticulous evaluation of the undervolted values and other miscellaneous adjustments. 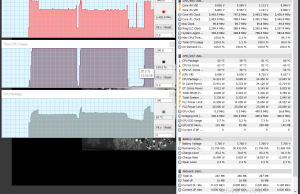 Right now I was able to set the CPU and the Cache by -95mV, which means, that together with the other tweaks this laptop more often meets with power limit throttling than thermal throttling under stress-tests. 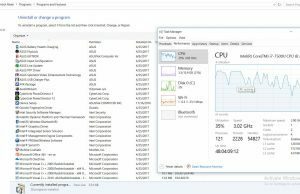 I've made many smaller tweaks and tricks to optimize windows and the hardware as much as I can. 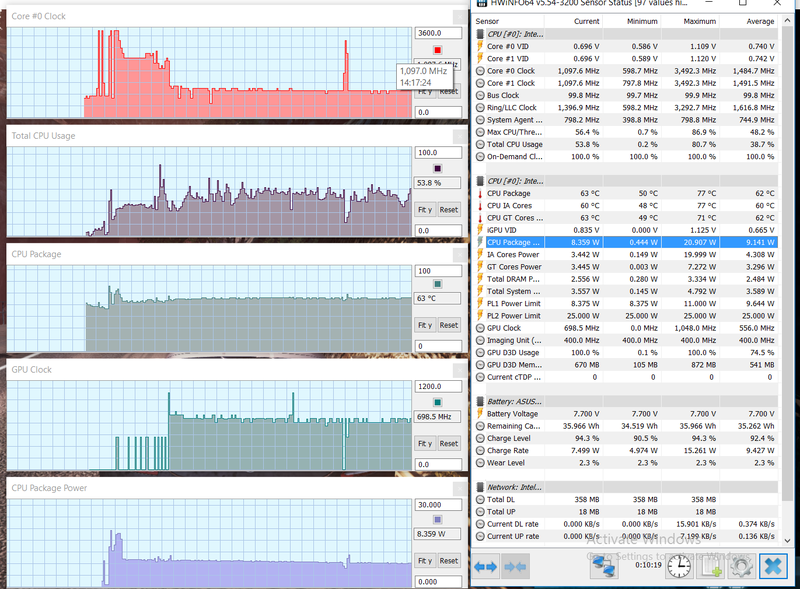 I've stress-tested the system in Intel Extreme Tuning Utility for more than 8 hours altogether without any hickups. 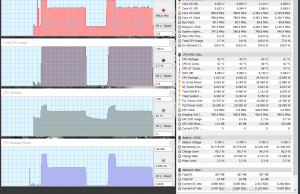 Until now I was able to get 10-20% more power out of my laptop comparing to other i8550u systems, with less noise, heat, and therefore better battery life. Please note, that I'm not an extreme tuner. 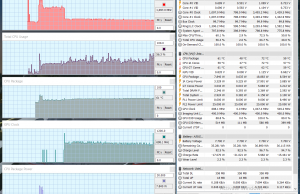 and I did not overclocked anything. I use this computer for business purposes mainly, so my approach was conservative and I like safe bets more than unstable systems. I'm sure there are some options to get more juice out of this combo. – 1st an almost fan-less laptop with 8-10 hours of battery capacity in cordless mode, for standard office and video watching scenarios (as I write this mini review unplugged, my battery is at 84%, and Windows 10 guesstimates 7hr and 31min remaining battery at 40% brightness (running apps: Chrome with 11 tabs, Wordpad, Cinebench R15, Intel Extreme Tuning Utility). It is pretty constant as I've checked it several times. 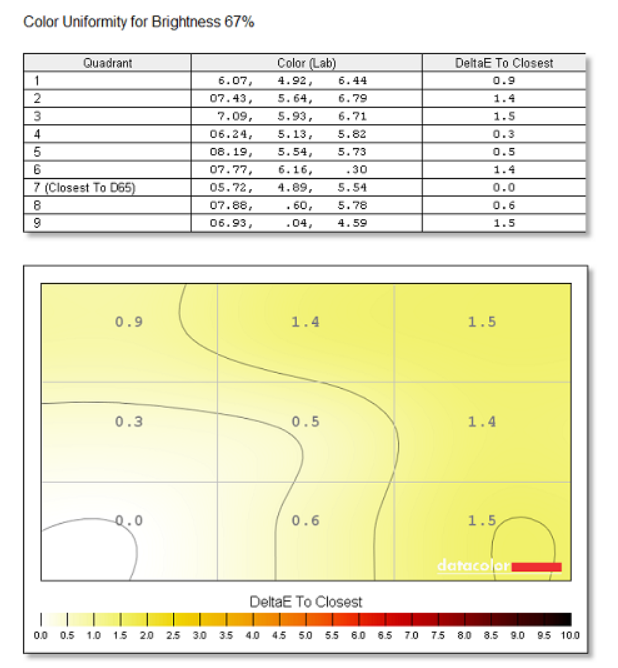 – 2nd If more output is required, I can change my setting with one click and let out the beast of this very powerful and not so thermal limited device. 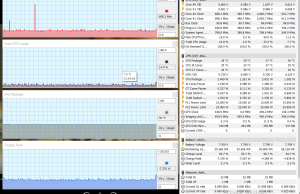 One more thing to mention: In case of the most extreme situation: even if I set everything to support the maximum performance, the CPU does not heat over 75-80 Celsius -average is 65-70- during the Intel stress tests and the batteries lasts for almost 2hrs at 100% screen brightness. and a very powerful machine whenever I have to process hundreds of raw files in Lightroom, or for multi-layered works in PS, etc. It's a strong, very well crafted, highly portable system if 3D gaming is not so important to you. And once again: it was much cheaper here than the Lenovo Yoga 920, HP Spectre X360, or Dell XPS 13" with comparable specifications. Please note, as I'm not a professional reviewer and not every system is identical, therefore take my findings with a grain of salt. I'll do additional tests and will check the and come back if there is something to mention. 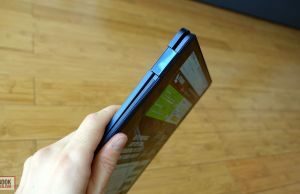 I'm so impressed by your review of ASUS flip S! Considering buying it now, the same version you're. 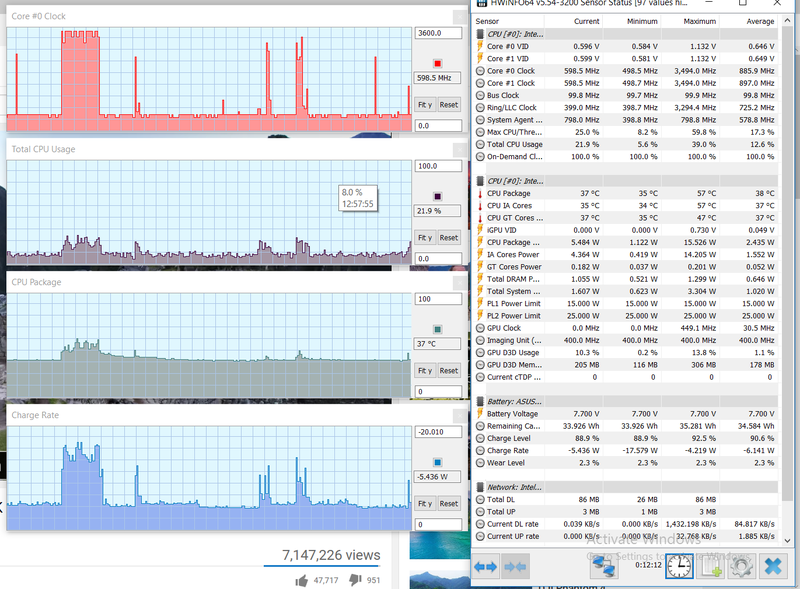 So, please, tell me, how it is after half-year usage. Are you glad of build quality, heat and noise? Is there something you disappointed? The only thing what changed was some decrease in the battery performance. Maybe some hidden services, maybe something else, I didn't have time to check this thoroughly, but the rate is around 20-25%. It's still more than okay in my case, so I don't worry too much about it. Thank your for the review. 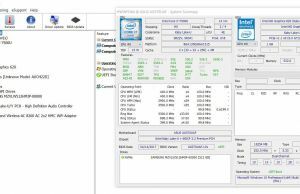 Between Asus UX370 and UX430. Which you recommend me? I'm looking a laptop, light, thin, with good speakers and display. I'm more into the ux430: better screen, matte, better performance, longer battery life. But if you want to flip touchscreen, the UX370 is the obvious choice. Up to you. Can the network card be replaced? 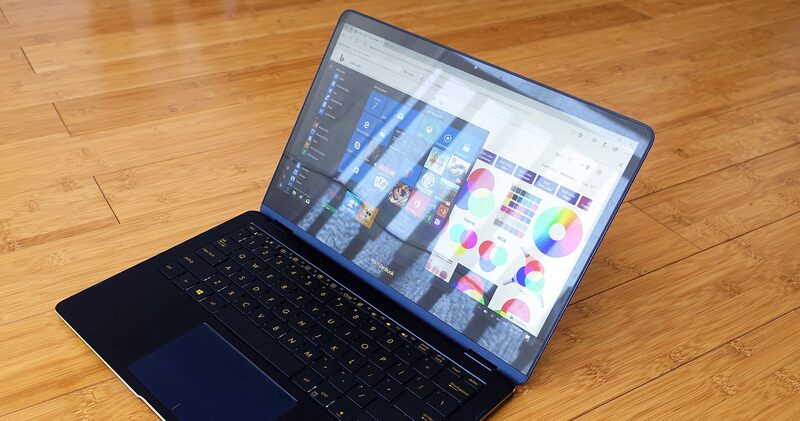 I would like a light, portable, fast, beautiful screen laptop. I'm not particularly interested in the touchscreen. I can't decide. Could you help me ? 2. Asus UX331UN i7,256 ssd, mx150 but i dont play games. They're very different. 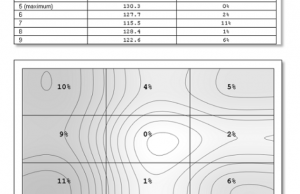 You should consider the applications you're going to run and the screen size. The i508250U is fairly capable, should be enough for most everyday tasks and some demanding loads, so I'd probably pick between options 1 and 3. You could also consider something with 16 GB of RAM is you can fit it within your budget.